CHARLOTTE, N.C. – Now is the time to DO GOOD! SHARE Charlotte and Hands On Charlotte’s DO GOOD Week, powered by Duke Energy, is in full swing through Saturday, April 29. The week, also celebrated as National Volunteer Week (April 23-29) encourages Charlotteans to volunteer or sign up to volunteer for future opportunities with local nonprofits. The campaign will culminate on April 29 with Hands On Charlotte Day, presented by Wells Fargo, which will offer more than 20 hands-on projects throughout the city for Charlotte volunteers. A community celebration will follow at NoDa Brewing from 1-3 pm. Volunteers from HOC Day activities will receive a complimentary beer from the brewery; 10 nonprofits will be on site at the celebration with quick and easy ways to DO GOOD. 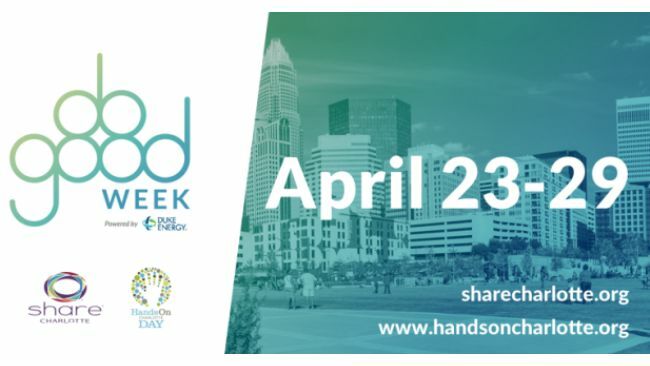 For more information visit sharecharlotte.org, www.handsoncharlotte.org or follow the #DOGOODWeek hashtag on social media.